Just when you thought Chopper Live: The Revenge couldn't get any more exciting, the producers recently announced the legendary rock band Lynyrd Skynyrd will headline the December 11th event in Las Vegas. 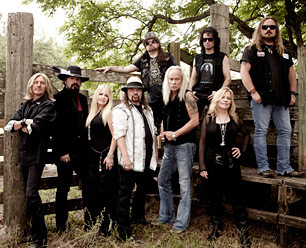 Lynyrd Skynyrd will join an already extensive list of Discovery talent participating in this major television event, including American Chopper stars Paul Teutul Sr. and Paul Teutul Jr., Outlaw Garage star Jesse James, and Fast N' Loud stars Richard Rawlings and Aaron Kaufman. The Rock & Roll Hall of Famers continue to build on the legacy that began over 35 years ago in Jacksonville, Florida with their most recent album, Last of a Dyin' Breed, debuting at No. 14 on the Billboard Top 200, making it their highest charting album since 1977. The band will be performing the title track from the new album as well as their hit "Sweet Home Alabama" during the show. Last year, Paul Jr. beat out his father Paul Sr and nemesis Jesse James to take the title and the honor of ultimate bike builder when he won Discovery's first ever American Chopper Live. This year, all three are back-plus Fast N' Loud stars Richard Rawlings and Aaron Kaufman--to duke it out in an incredible four way bike build-off. In this two-night special, fans will to vote on their favorite bike after seeing the four finished products during our regularly-scheduled American Chopper on Monday, December 10th at 9pm ET/PT. The following evening at 9:00pm ET/PT, Chopper Live: The Revenge will air from Las Vegas's Hard Rock Hotel & Casino for what's sure to be a night that will go down in Discovery history.